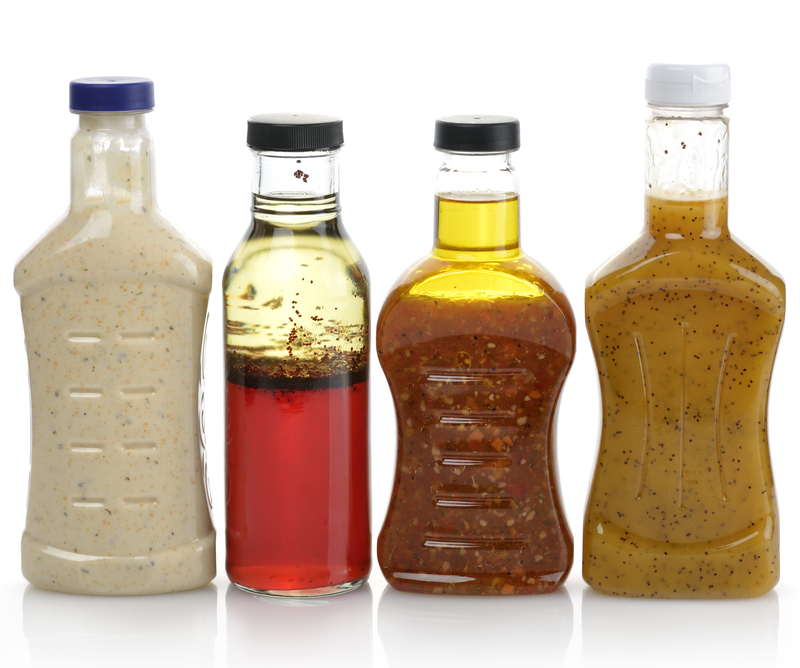 Salad dressing can be your best friend or your worst enemy when watching your weight. It can either turn your salad into a healthy, low calorie meal…. or make it a diet pitfall full of saturated fat, sugar, and preservatives. Challenge yourself to be a salad dressing detective at your next trip to the grocery store so you aren’t fooled by this seemingly harmless condiment. Try to pick a less busy time of the day to investigate so you aren’t distracted by busy shoppers. Depending on the size and ingredients, a dinner salad can be unhealthier than a cheeseburger if you chose the wrong topping and salad dressing. It is quite surprising how much sugar, trans fats, and preservatives can be added to salad dressings, so it pays to look at the nutrition label and the ingredient list. Don’t be fooled by claims on the front trying to sell you their product. Reduced-fat and fat-free dressings tend to have more sugar and thickeners than “regular” dressings and often have high fructose corn syrup as the first ingredient! Go to the salad dressing aisle at the grocery store. Pick up several different salad dressing and study the nutrition label and ingredient list. Choose a variety of brands and flavors. This will take some time so try not to pick a busy time of day to complete this challenge. Try to find dressings that don’t have refined sugars in the ingredient list, especially in the first 5 ingredients on the list. Look for products that have 0-1 gram of carbohydrate per two tablespoon serving. Try to find dressings with less than 6 grams of fat per twp tablespoon serving. Look carefully for partially hydrogenated oils, which is trans fat that you defiantly want to avoid! Look for some of the potentially harmful ingredients you may find: High Fructose Corn Syrup, Natamycin, Calcium Disodium EDTA, Carmel color, Sulfur dioxide, MSG (monosodium glutamate), and Artificial Sweeteners. Finish by selecting the healthiest possible brand and variety for your salad dressing, if any at all! Now when you shop, you can quickly grab this item, knowing that you’re making the best possible choice. After educating yourself about the ingredients, you may decide to make your own dressing instead. To make you own vinaigrette, use extra virgin olive oil or another high quality unsaturated oil, vinegar of your choice or lemon juice, mustard (optional for binding), herbs, and spices. Feel free to experiment! Written by Sara Nicole Ansari, R.D.